InvestmentNews’ revelation that independent broker-dealer LPL Financial terminated James Bashaw for “selling away” marks the second high-profile brokerage firing for similar infractions in a few weeks. But the latest case doesn’t shed light on why this infraction, by some accounts tolerated in the past, is now a firing offense — especially when other business models don’t even consider it an infraction. A more detailed Finra form called the U5, filed by brokerages when an advisor leaves, will be available to the public by request “in about four days,” says Finra spokeswoman Nancy Condon. LPL would say only that Bashaw was terminated last month and that the reasons for the action are in the U5. Bashaw, a broker since the mid 1980s, was Barron’s pick as top Texas advisor in 2011, when his team managed $3.8 billion. Another recent high-profile termination for allegedly selling away came about three weeks ago when Merrill Lynch fired brokers James Goetz and Stephen Brown, who together managed $2.5 billion. Mark Elzweig, a New York-based headhunter, says Bashaw wasn’t an employee of LPL Financial. But, he adds, the dismissal of an independent broker sends the same warning signals to clients and other brokerages as an outright firing from an employed-advisor firm. Most of Houston-based Bashaw’s team has moved to independent broker-dealer Wunderlich Securities, which is based in Memphis, Tenn. Bashaw himself has applied to follow suit, but awaits approval, according to his CRD. 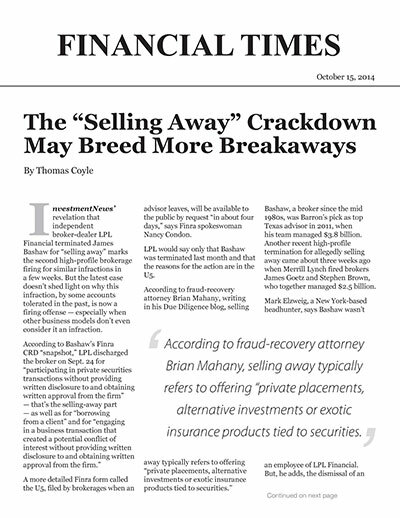 Selling away — though officially frowned on — seems to have been at least tolerated by brokerages when large, profitable teams were doing it, a recruiter who asked not to be named tells FA-IQ. “You have to wonder what’s changed,” she adds. But the same source says Finra may be signaling the industry to take compliance around selling away more seriously. And firms may be cleaning house in response — even if that means hiving off profitable teams. If true, this could add to the “breakaway” drama by giving so-called captive advisors another grievance. The struggle is unfolding, as big brokerages fight to retain market share lost — at least in part — to independent RIAs that have no centralized investment approval and due-diligence hubs to sell away from.